Fire extinguishers in commercial premises require, by law, annual servicing by a Competent Person to British Standard 5306 Part 3 & Part 9. The legal requirement for this is stated in the The Regulatory Reform (Fire Safety) Order 2005. 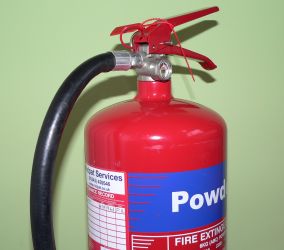 Midpat Services can fulfil this fire extinguisher servicing requirement using our IFEDA trained Service Technicians. New extinguishers, regardless of where they have been bought from, must receive a commissioning service at the location prior to fitting to ensure they have not been subject to damage in transit and additionally ensure suitability for use. They cannot be sold as commissioned if sent by post or purchased from internet auction sites. You will invalidate your insurance. When you use Midpat for fire extinguisher supply and installation all extinguishers have this done for free when we deliver them to site. We are also able to install brackets and supply signage alongside with regards to the requirements of BS5306 Part 8. Our services contain no hidden extras, the price we quote per unit is the price you pay. Remember to choose midpat for fire extinguisher servicing, fire extinguisher supply and fire extinguisher Inspection around the Cannock area.